What do people think about corruption? Home > What do people think about corruption? The ICAC recently surveyed 501 members of the public in NSW to ask about their perceptions of corruption and the ICAC itself. While the survey results are generally similar to those obtained when the last survey was conducted in 2012, significantly more respondents could name the ICAC as NSW’s anti-corruption body and significantly more indicated that they were very willing to report serious corrupt conduct to it. The ICAC has periodically conducted its Community Attitudes Survey (CAS), since 1993. This survey asks members of the public to provide their perceptions of corruption and the ICAC. Given it had been three years since the CAS was last conducted, the ICAC decided to administer it again in 2015. A contracted research company surveyed 501 NSW adults on behalf of the ICAC in November and December last year. Respondents were selected in a manner that ensured that the sample was broadly representative of the NSW population in terms of variables such as age and gender. The survey’s items covered four key areas: perceptions of the extent of NSW public sector corruption, awareness of the ICAC, perceptions of the ICAC’s effectiveness, and willingness to report corruption to the ICAC. Overall, respondents expressed some degree of concern about the extent of NSW public sector corruption. For instance, 31% of respondents indicated that corruption was a major problem in the NSW public sector, with a further 47% reporting that it was a problem but not a major one. Similarly, 50% of respondents indicated that NSW public sector corruption affected them or their family. These figures are similar to those obtained in 2012.
resulted in a poorer quality public sector workforce. Awareness of the ICAC’s functions appears to have increased when compared with the results from the previous CAS. In the 2015 survey, 36% of respondents could name the ICAC as NSW’s anti-corruption body, which was significantly higher than the corresponding figure of 25% from the 2012 survey. However, while a total of 83% of 2015 survey respondents demonstrated some awareness of the ICAC, this figure does not significantly differ from that obtained in 2012. In general, respondents positively evaluated the ICAC’s performance. A total of 93% of respondents indicated that the ICAC was a good thing for the people of NSW. Additionally, 75% of respondents indicated that the ICAC had been successful in exposing NSW public sector corruption and 60% indicated that it had been successful in reducing the level of corruption within the NSW public sector. These figures are similar to those obtained in the 2012 CAS. Survey results also suggest a strong willingness among members of the public to report corrupt conduct to the ICAC. The percentage of respondents who indicated that they were very willing to report serious corrupt conduct to the ICAC was 56%, which is a significant increase over the figure of 41% obtained in the 2012 survey. In total, 84% of respondents indicated that they were willing or very willing to report serious corrupt conduct to the ICAC, which is similar to the figure obtained in 2012. 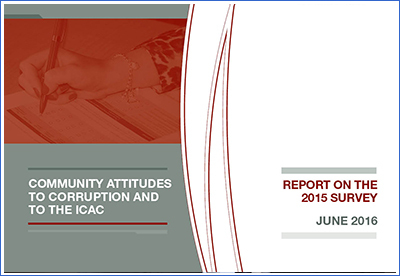 The 2016 report, Community attitudes to corruption and to the ICAC, is available on the ICAC website.